Last weekend we were at the show in Frankfurt with Damsey to compete in the finale of the Louisdor class for young Grand Prix Horses, for which Damsey qualified by wining the class in Herolsberg. In the first round Damsey was very impressed by the surrondings of the Frankfurter Festhalle and finished 8th. In the second round on sunday Damsey started impressivley with a trend of 74%. Unfortunatly Damsey was too tired after the long weekend to show his potential in the piaf/passage-tour. The international judge Dr. Schüle praised in his commentary Damsey's great gaits and his possibilites as a Dressage horse. 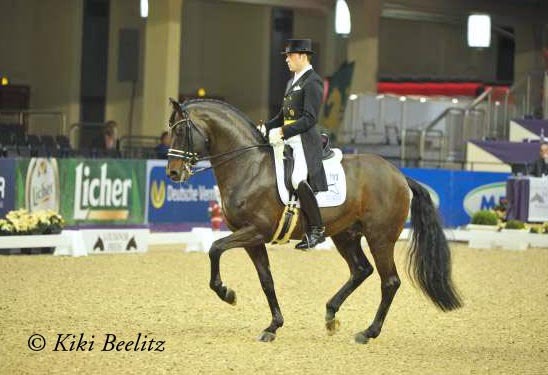 He also complemented his breeding success of being under the top 1% of the german dressage sires. After this successfull show season we grant Damsey his very earned christmas break.